What: Emo-busting. WHO YA GONNA CALL?? Warnings: emo, and the busting thereof. There were people who offered shoulders to cry on, people who gave hugs and spoke in comforting voices. Terrence had given hugs and offered his shoulder on occasion, but it really wasn't his preferred method of helping people get over the things that were troubling them. No, his tactics were rather unconventional, and not always the same. Sometimes he provoked people into fighting him, sometimes he was cheesy and ridiculous until they couldn't help but laugh. Either way, it was theoretically at his own expense, except that Terrence didn't mind being punched and laughed at. Especially when he'd provoked that reaction on purpose. Today, when he stepped into the Floo, he held a crate full of his pet crabs under one arm and a board game in his other hand. Stuffed under his cloak was his superhero costume, though he wasn't going to break that out if Bill wasn't in shape enough to wear his. If there were other things needed for this particular cheering up mission, well, he'd improvise. He was good at that. He stepped out of the fireplace and made a mental joke to himself about the place being veela-free - well, that was one joke he wouldn't make out loud. Probably. For now, when he opened his mouth, what came out was, "Hey, Billy Goat. Are you sleeping?" Fred...or someone...maybe it had been Mum (needless to say it wasn't his best focusing day) had left just a little bit ago to take care of something. He thought it might be food related. He wasn't altogether sure. His focus had been in and out. Yesterday hadn't been much of a brilliant day. Spending most of it crying into his pillow had not been his favourite activity. He was trying to get it all out before Toire came over for the weekend. Maybe it would be good for them. Maybe it wouldn't. He wasn't sure. At the moment, Bill was sitting on his couch, staring ahead at the wall without really seeing it. It was a minute before he registered that someone had spoken. He really should be getting better at this. The only word he really caught was 'sleeping' which didn't really make sense without context. "Sleeping?" His voice was distant as he turned to look for the owner of the voice. Once he noticed T standing there, Bill blinked a few times. "T," he said, voice only vaguely less distant than it had been. "Hi." Frowning slightly, he mentally chided himself for not being good with words. "So-" But something told him it was silly to apologize. It was about that time that he noticed the box. "What's in the box?" Terrence probably would have ignored the apology, even if it had been offered. Words could be fun, but when it came to emotional shite, they pretty much failed. He was a fan of resolving issues without having to talk about them, though he was aware that didn't work for everyone. He returned the greeting with a grin, moving into the room. "Hey. Entertainment has arrived, my friend." 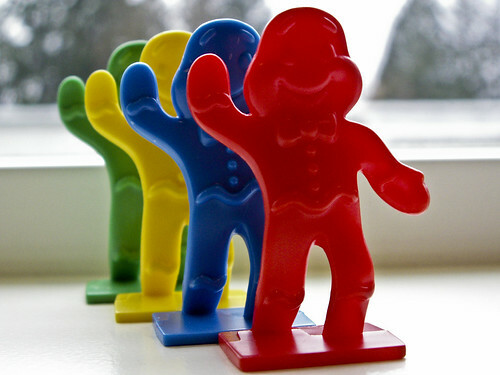 "This," he said, holding up the game box, "Is Candyland. I assume you've played? Well, playing it with me is different anyway, I like making up my own rules. And these," he said, setting down the game to hold up the crate, "Are my crabs. They've got hilarious names, and they're fun to race. I'll introduce you." He set the crate down and picked the crabs up one by one to introduce them by name: Lord Tuffington von Hefferschtat, with the purple dot on his back; Sister Mary Catherine with the pink dot, who had once been a stripper named Candy Cane; Blue Balls, named for the blue dot on his back; red and green as Rudolph and Vixen Ho, respectively; and Bob Blitzen, yellow, who Terrence always introduced last because he found it hilarious. All sorts of complicated, fancy names... and Bob. "So what's it going to be, mate? Candyland or crab racing?" Bill tried to muster something of a smile, but his muscles weren't working with him at the moment. Maybe they'd figure it out after some time had passed. For now, he'd just nod and stare at the boxes again. It would be fine. As fine as it was going to be. "No," he said quietly. "I haven't." He thought someone might have mentioned it before, but he had never actually played himself. He didn't know. Part of him didn't really care, but it was better than staring at the walls again. "Crabs?" Bill stared at them quietly as they were introduced, lips twitching just slightly into something vaguely resembling a smile. "I don't..." Bill quieted for a moment, eyes looking between the box of crabs and the board game. "I'm not sure." He really didn't like that he felt like it worked for everything right now. 'Not sure' had slowly become the way he felt about everything. He didn't like it. "How do you play Candyland?" "Well, it's like a drinking game with candy," Terrence said, as he left the crate of crabs alone to rustle and click amongst themselves while he set up the game. "Which automatically makes it awesome. Whoever gets the most candy wins." When he opened the box, he revealed not only the game board and pieces but bags of candy - mints and chocolates and gumdrops, and even a supply of gingerbread cookies. That was definitely not in the original rules, but he didn't care. "Pick a color and we'll get started." Bill glanced at the board curiously for a moment before smiling just slightly. "It's like Hogwarts colours," he said, finding amusement in something he supposed was very small. He knew if he picked red it would be like picking Gryffindor, but...he liked red. "I like red." As he reached for it, he focused his gaze on the little piece, tensing just slightly as he went to pick it up. He just wanted to see if he could. It really was a bit difficult to ignore his hand shaking, but he was hoping no one else was paying as much attention. After a moment, he swore under his breath. "Can you..." He frowned a little. "I still want to play...I just...might need help." And Bill really, really hated to ask for help sometimes. Absorbed in setting up the game board, Terrence only noticed the trouble Bill was having with holding the game piece. He glanced up when he heard his friend swore, and batted playfully at Bill's hand. "Oi, mate, who said you're supposed to move your own piece? That's up to the God of the Game. Otherwise you're likely to cheat just to get more candy." Alright, yes, he'd made that up on the spot, but Bill didn't need to know that. "Right, if you're getting red, I'm taking green. We'll reenact the Gryffindor and Slytherin wars over candy. For the record? Snakes can unhinge their jaws to swallow things whole, so you don't stand a chance."